You need beadlock strength? We have it. You need simulated beadlock style? Got it. And it's all designed to improve your ride and traction and off-road performance. Will They Fit? Check The Chart! If you want to know which System 3 Off-Road wheels fit your UTV, just check out complete Application Chart. It gives all the details on size, bolt patterns, finish options, vehicle fitment, and more. The SB-3 Beadlock wheels by System 3 Off-road are engineered for aggressive riding and punishing terrain. These beadlock wheels feature classic Baja styling and rugged modern construction. 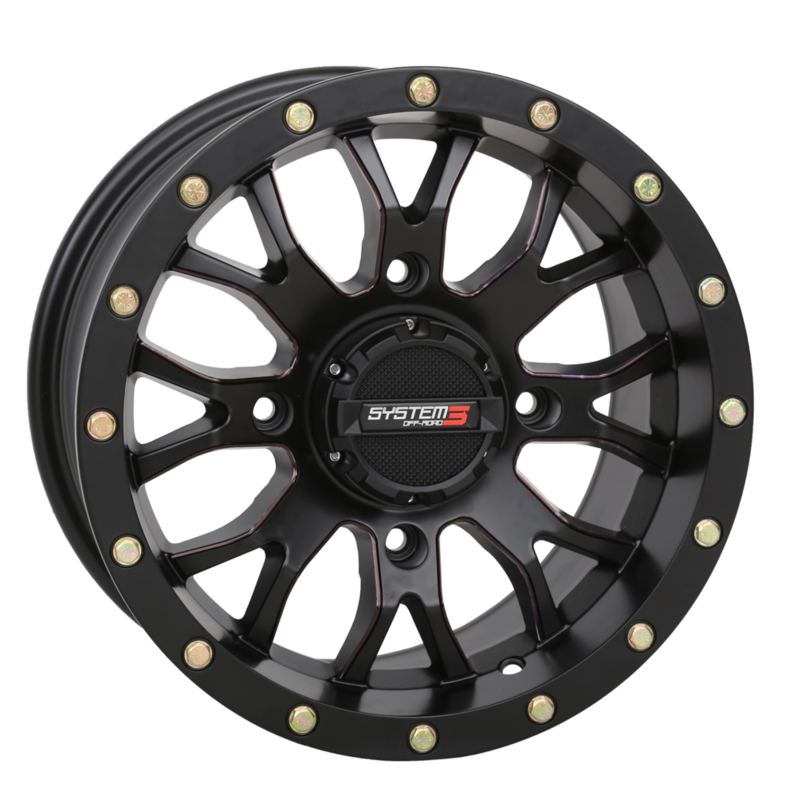 With a 10mm billet ring, 5/16-inch Grade 8 bolts, and a 1500-pound load rating, the SB-3 is the strongest cast UTV wheel on the market. The wheel's stainless steel lug inserts are an industry first for a UTV wheel; these inserts ensure a tight fit that won't go oval-shaped with use. 10mm billet ring and 5/16-inch Grade 8 hardware. Stainless-steel lug inserts - an industry first. The ST-3 wheels by System 3 Off-road feature beadlock style in an edgy design with 8 split spokes. A heavy-duty inner and outer wheel lip and outer cadmium-plated bolts show the wheel is built tough. Large lug holes accommodate most hex head lug nuts.